I'm not on the iPhone bandwagon yet, preferring my cell phone to be as small as possible and do little more than, well, make phone calls. But luckily, plenty of people around me are all too eager to show off their new iPhone apps. And when it comes to finding a restaurant, let's just say I kinda wish I had an iPhone. I love UrbanSpoon's slot machine-esque restaurant application, above. Give the phone a shake, and using GPS, the app finds restaurants nearby. You can lock in neighborhoods, price points and cuisine types. Click here for a demo. Download here or from your phone. Washingtonpost.com also recently launched an iPhone app, at right, that puts the site's City Guide contents at your fingertips. You can pull up Tom Sietsema's reviews, phone numbers, addresses, directions and more. Very handy. Get it here. Not as handy would be my husband's favorite: the virtual pint of Carling beer. 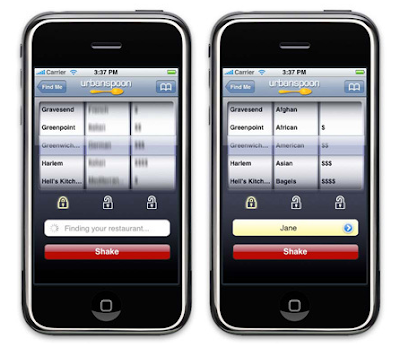 Have a favorite iPhone food app? more like finding an app, I would act like I might use but really only show off during cocktail opportunities ... Ulysses by James Joyce wins ... now on my iPhone I can read: Mr. Leopold Bloom ate with relish the inner organs of beasts and fowls. Or: Most of all he liked grilled mutton kidneys which gave his palate a fine tang of faintly scented urine. Not necessarily a food app, but the Cocktails app is a great resource. Made by the same folks at CocktailDB, it provides classic cocktails from multiple books (complete with citations). Probably my favorite application for the iPhone. I'm waiting for someone to have their phone slip out of their hands during the "shake" aspect of any app or game and then sue Apple for inducing them to break the phone, a la Wii remotes smashing into the television. The UrbanSpoon app isn't quite up to date, but I think the WaPo one would be more useful to me--Tom to Go! The Yelp app, obviously. Location-aware reviews of the best places around town. Joints in walking distance of GPS positioning, written by local people in a handful of touches? Total win. You can also find free iPhone apps at storedapps.com. Perhaps you can also review our site in your blog? Thanks.